Attention all Spudder alumni! Come enjoy lunch at RHS while reconnecting with former classmates! 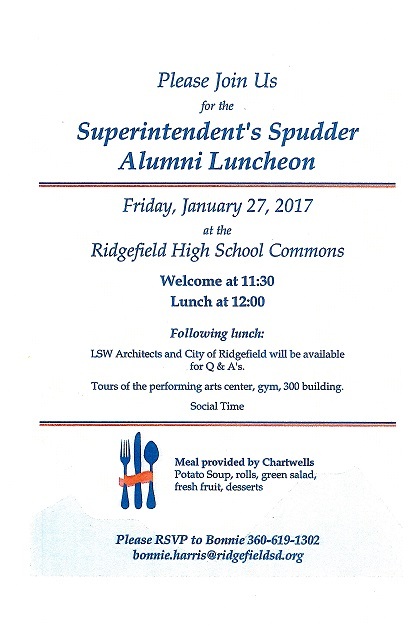 Ridgefield School District cordially invites all Spudder alumni to attend the Superintendent’s Spudder Alumni Luncheon at the RHS Commons on Friday, January 27th starting at 11:30 am (lunch served by Chartwells at 12 noon). All Spudder alumni and their guests are welcome! The event will also include tours of the high school’s new gym and performing arts center and a Q&A session hosted by LSW Architects and the City of Ridgefield to provide information about the 2017 bond program.